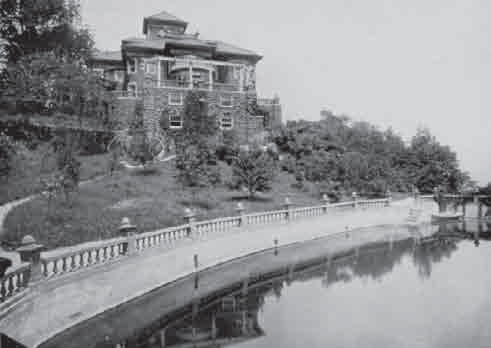 Tales of mansions that stretched for twelve miles along the cliffs of the New Jersey Palisades from Fort Lee to the N.Y. state border have fascinated many of us. Known as Millionaires’ Row, the wealthy in the mid-19th century were drawn to the river views and summer breezes. Most of these estates were knocked down with the construction of the Palisades Interstate Parkway; all that now remains are a few stone walls, a scattering of foundations and steps leading nowhere. John D Rockefeller Jr. who worried that the completion of the George Washington Bridge in 1931 would lead to over development along the cliffs began quietly buying up property along the top of the Palisades. With the Great Depression underway, a number of owners welcomed a chance to sell. In 1933 Rockefeller donated 723 acres to the Palisades Interstate Commission to be used for a scenic parkway with the remaining land returned to its native state. (The Commission was formed in 1900 when the N.J. State Federation of Women’s Clubs, with the help of a $125,000 donation from J.P. Morgan, pressured the legislature to close the quarries along the shore-line that were blasting away the Palisades.) WWII delayed the start of the parkway but it was ﬁnally under way in 1947 and completed near the Tenafly/Alpine border in 1954. Joseph Lamb, the founder of one of the most prominent U.S. stained glass studios, was the ﬁrst to build a retreat in 1858 near the Tenaﬂy/Alpine border, which he called Falcon Lodge. To reach his estate he would take the train on the east side of the Hudson, request a special stop, and be picked up by a ﬁsherman who rowed him to the other side where he climbed a steep path to his lodge. Colonel Sweeting Miles soon followed, building his home on Pulpit Rock. Miles had a large steam-powered cereal mill just below his house on the river at Alpine Landing. Charles Nordhoff, a reporter for the Evening Post, built a nearby estate with an elaborate garden. His wife is said to have named Alpine. Gilded Age architect J. Cleveland Cady built there too. A principal in the ﬁrm Cady and Gregory, he was responsible for the design of many important buildings such as the first Metropolitan Opera house, early wings of the Museum of Natural History and fifteen structures at Yale. Locally he designed the Demarest train station and the Alpine Community Church at the top of Closter Dock Road. Of his many accomplishments, the one he was most proud of, according to his 1919 obituary, was serving as superintendent of the Sunday school for fifty-three years at the NYC Church of the Covenant he had designed. William Buck Dana and his wife Katherine Floyd Dana built Gray Cliffs on the Englewood Cliffs. Dana owned the Commercial and Financial Chronicle, the leading big money paper of the day. His wife, a writer, artist and a descendant of William Floyd, a signer of the Declaration of Independence, secretly assisted him with the writing. Because it was not proper for a woman of her day to be involved in commerce, she wrote short stories and children’s nursery rhymes under the name Olive A. Wadsworth; the initials stood for “only a woman.” The childless couple who adopted several children, ran a Sunday school for the worker’s children. Billy Allison, a river man’s son, attended. When the couple offered to adopt him, his father said they could raise him as a ward but that he had to keep his family name. William Allison became highly successful, becoming a banker and investor in railroads and real estate. He was one of the investors in the Palisades Mountain House, a cliffside hotel that could accommodate 500 guests. When the short-lived hotel burned in 1884, he built his Cady-designed mansion on its grounds, which in 1902 also burned down. Allison, largely responsible for Englewood Cliffs splitting off from Englewood, became its first mayor. Upon his death, several acres of his property were donated to the town and now make up Allison Park. The Sisters of St. Joseph purchased five and a half acres next to his property in 1886 and built a retreat for young women. It is now the Villa Lourdes, a home for aged sisters. They purchased an additional seven from the Allison estate in 1903, constructing an orphanage and school, now St. Peter’s College. The George S. Coe mansion was just north of the Dana mansion. He was president of the American Exchange Bank. William C. Baker, an inventor who held a patent on regulating heat, purchased twenty-five acres in 1871. Christened Cliff Dale, it had a fifteen-room house, numerous out buildings and, with his development of a steam-heated incubator, an 800-foot long hennery that hatched 200,000 chickens. The elaborate terraced grounds had fountains and a lake that flowed into a waterfall dropping to the river below. Alpine Public School is on the grounds today. The arrival of the 20th century saw more estates. Dr. Ernest Cadgene built near the present Rockefeller Lookout. A chemist from France, he operated a silk-dying mill in Paterson. Its stone entrance with tall iron gates can be seen along 9W, roughly opposite the CNBC building. In 1904 Spanish-born Manuel Rionde, a Cuban sugar dealer, and his wife Harriet bought thirteen acres. At the time of his death his property, which he called Rio Vista, extended to 200 acres, running from the center of Cresskill to the cliffs. Its wrought iron fence remains along the cliff edge. The manor house was built where Alpine Lookout is today. There was a carriage house, a garage with a rotating platform, squash and tennis courts, a pool, a manmade lake and a 100-foot high clock tower, which still stands, that had a library and a chapel. After Alpine rejected Rionde’s offer to donate his estate to the town, part of it became the home of the 138-acre Tammy Brook Country Club. Manuel’s nephew, Manuel E. Rionde, who it is believed he raised, built Glen Goin on the grounds of the Nordhoff estate. He was mayor of Alpine at one time. Before moving to Sarasota, Florida, John Ringling of the circus fame built Gray Crag on the cliffs. Heiress Cora Timken Burnett designed an eccentric house in an isolated area on the Alpine cliffs that had a 100-foot long bomb shelter and an original Indian temple. Her husband John was an osteopath and scientist who experimented with electro-magnetism. A serpent-shaped swimming pool can still be found. It was the only estate not amicably acquired to make way for the parkway. In 1911, George Zabriske, a bachelor from one of Bergen County’s wealthiest families who was the N.Y. representative for Pillsbury Flour Mills, bought W.C. Baker’s estate, continuing to call it Cliff Dale. As president of the N.Y. Historical Society, he fought to preserve New York City’s historic landmarks. Part of his gray stone house still stands, as does a portion of the stone wall near Hillside Avenue in Alpine that can be seen from 9W. Herbert Oltman, a stockbroker who had inherited a seat on the stock exchange from his father, built Penlyn, one of the last estates, in 1929. It included nine and a half acres that ran between Sylvan Blvd and the cliffs. Oltman survived the stock market crash but a financial reversal forced him to sell the property ten years later. It is now the Palisades Park Commission headquarters. The Parks Commission offers guided hikes led by Eric Nelsen, its historic interpreter, throughout the year. Call 201-768-1360, x 108, or go on their website, www.njpalisades.org, for more information.